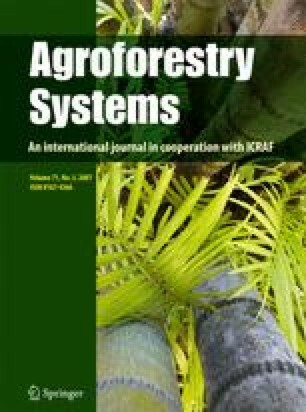 The potential forage value and appropriate length of study on intake and relative palatability ranking of 40 multipurpose tree species (MPTs) were determined using 24 sheep blocked on live weight and age. As the MPTs had different dry matter contents, intakes were also expressed as a ratio of quantity offered (Ai/Di). Using daily Eragrostis tef straw offer (TD) and intake (T), relative palatability indices were calculated as Ri = (Ai/Di)/(Ti/TDi). There was a significant (P < 0.0001) decrease in correlation of intake measured in day 1 and subsequent days (r = 0.88, 0.81 and 0.79 for days 2–4, days 5–8 and days 9–12, respectively). A similar trend was observed on corresponding palatability indices. Individual animal preference and blocking did not affect intake and palatability indices significantly (P > 0.05), however significant (P < 0.0001) tree species differences were observed. Results on linear regression, correlation coefficients, palatability ranking and standard errors of means (adjusted palatability indices) indicate that, if palatability is done to predict long-term intake of MPTs, at least 5 days are appropriate in palatability assessment for sheep. Using mean palatability index (days 2–12), the MPTs were grouped into four clusters. The MPTs such as Leucaena leucocephala and Sesbania sesban which are known to have good nutritive value had high palatability. In the same classification group, there were less known species such as Acacia venosa, A. persiciflora, A. melanoxylon, A. hockii, A. polycantha, Tamarindus indica, Chamaecytisus palmensis, Tipuana tipu, Indigofera arrecta and Atriplex nummularia. Flemingia macrophylla, Erythrina abyssinica, Acacia salicina, Acacia coriacea, Albizia schimperiana, Ceratonia siliqua, Casuarina glauca and Erythrina burana had poor palatability. These species seem to have little forage value for animals with short-term adaptation periods. Gliricida sepium and Calliandra calothyrsus although currently being used by farmers had a medium palatability ranking.